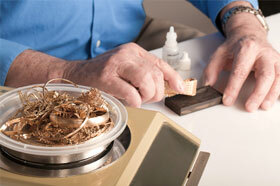 The Price of Gold is currently at all time high’s, so many people are trading in their old jewelry for cash. The Cash for Gold Industry is relatively new, and not a lot of people are familiar with the process. This makes it easy for some people to take advantage of their clients. Here at Sacramento Gold Buyer, we believe in transparency. We perform all of our transactions directly in front of our clients, so that people leave our store, with 100% assurance that we carried out their transaction fairly, honestly, and ethically. 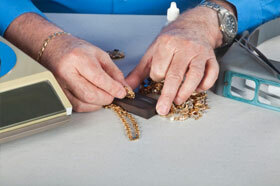 We test your jewelry IN FRONT OF YOU, we do not take it into the back like some other buyers do. We have nothing to hide! We weigh your items IN FRONT OF YOU, with a legal for trade, NTEP Certified Scale, which has been approved for use in our business by the Sacramento Department of Weights and Measures. 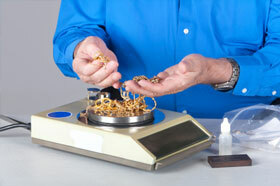 We calculate a purchase price for your items, based on Spot Price, Karat content, and Weight. If you accept our offer, we will pay you cash, or company check, on the spot.